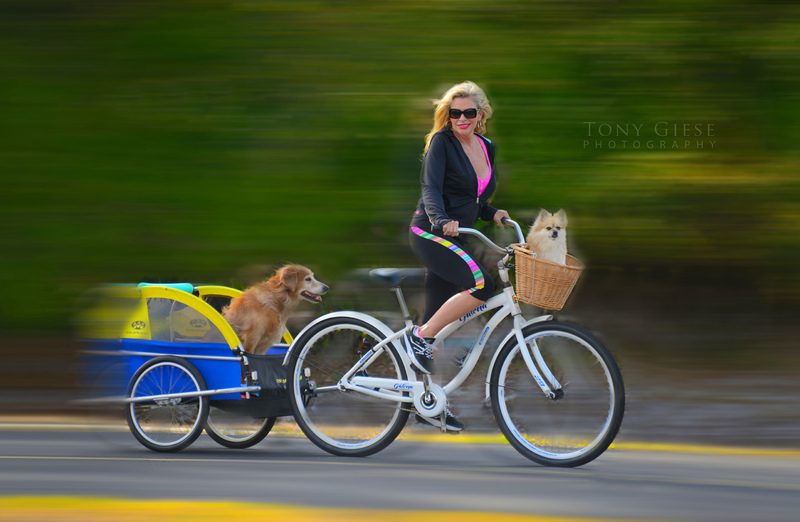 The joy of bike trailering a Golden Retriever with Pomeranian riding in basket. 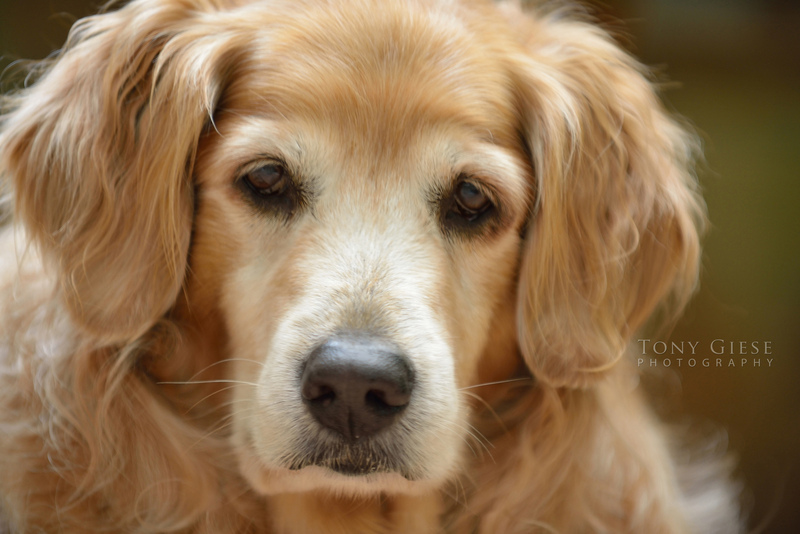 Bring out your dog’s amazing character with a successful photograph! 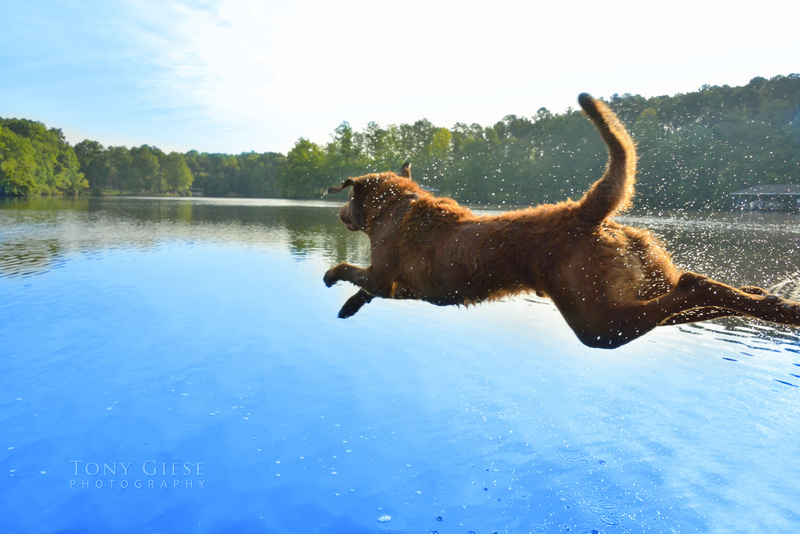 If your dog is active, show them running, jumping, swimming or performing their own trick in action. 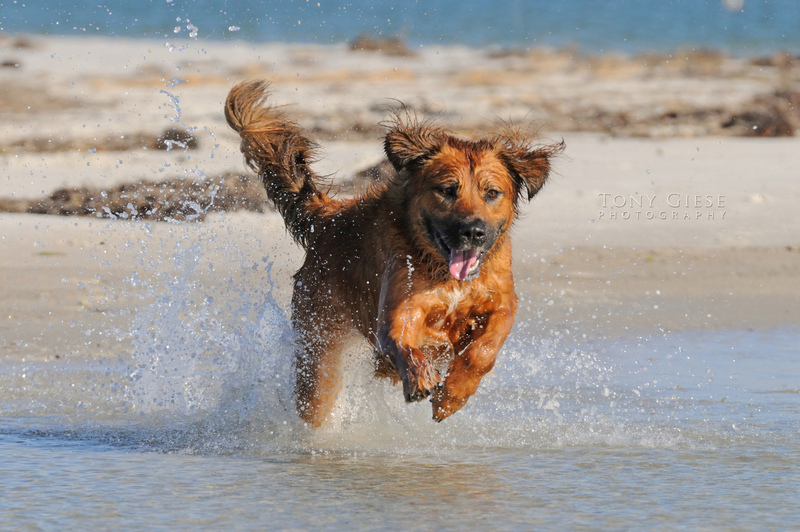 This rescue dog loves running on the Daytona Beach, Florida. It’s important to get down to their level. 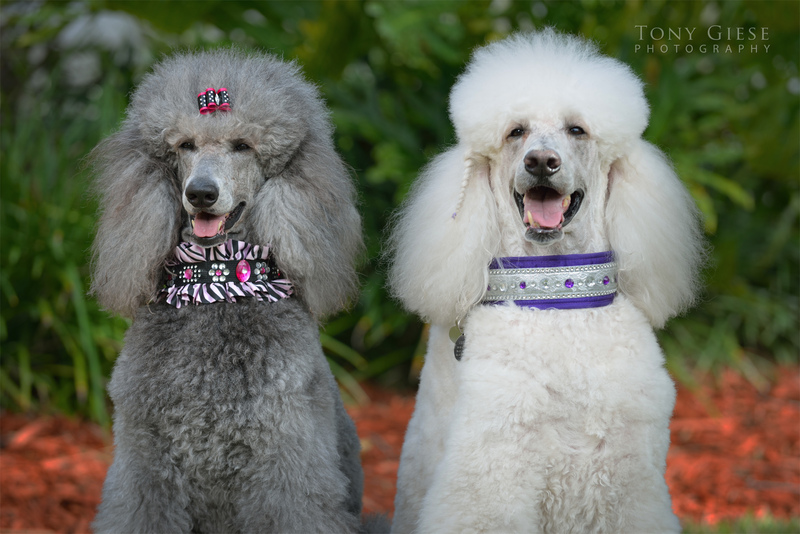 As a pet photographer will look through your dog’s world from his or her point of view! It’s best to lay on the ground and shoot from the dog’s perspective. 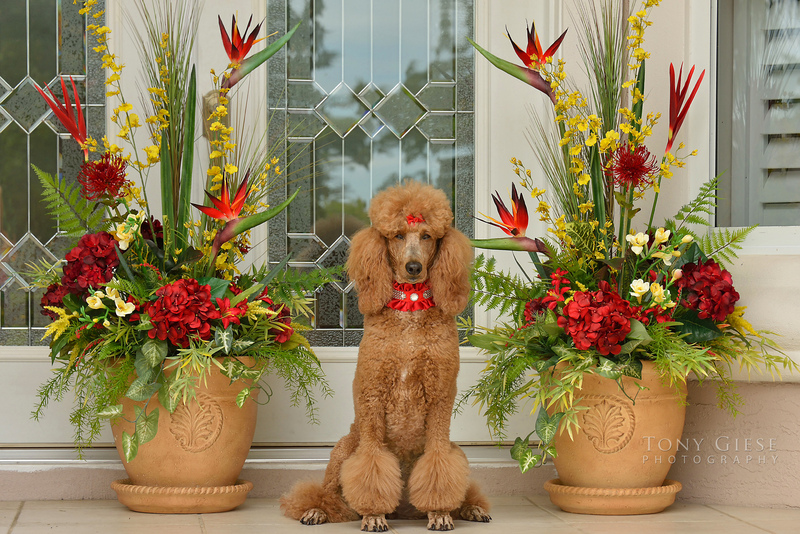 Standard Red Poodle with matching flowers. 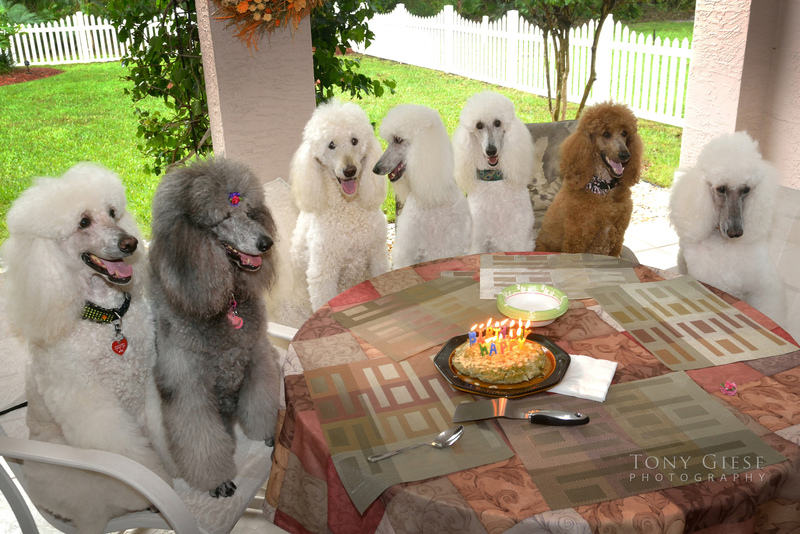 It’s important to bring treats or peanut butter to every dog photography session. This provides your dog with a affectionate reward helping you create a positive experience when your pet sees that camera. This action will quickly enhance a confident association in your dog’s attention, and the rest is all tail wagging experience! Most dogs do not want to sit still and have a keen sense of good smells, for they need to sniff every few feet in all other directions. Pet photography requires a lot of patience. If you’re even-tempered enough, they will end up by simmering down and you will have the circumstance to capture that amazing moment in your dog’s photograph. So helpful in understanding a dog sensitive environment around them and most especially – a photographer’s positive energy. Take your time and enjoy trying new approaches with different angles and exciting visual compositions in photographing your dog. Shoot a lot of photos with a telephoto and or a wide angle giving you interesting results you can later edit. Experiment by using different lenses. Filling the frame with your pet’s face and big eyes and tight close up shots often make beautiful dog portraits. It’s best to let your dog play discreetly. Once you have, you are all ready to call for him by making sounds from some type of squeaky toy or noise maker. This will surprise your dog and catch it’s attention, providing the alert pose to snap that perfect image. 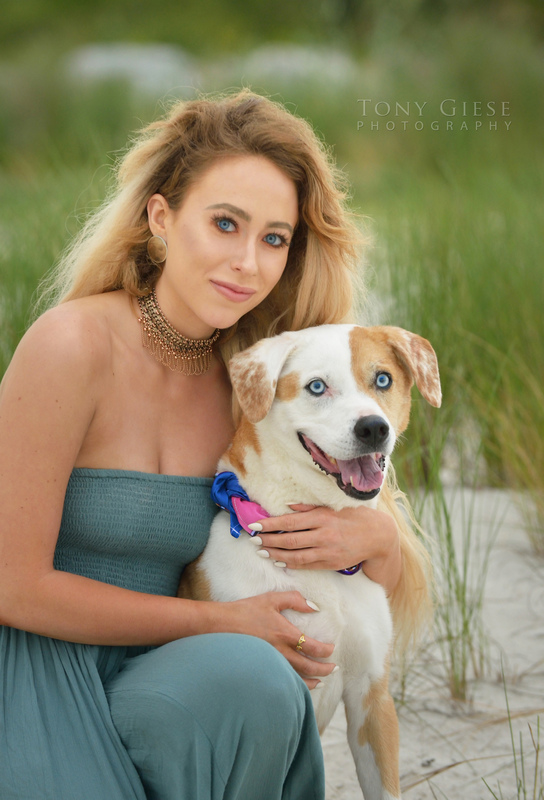 Blue eyes match in this portrait of a girl with her dog on Daytona Beach, Florida. 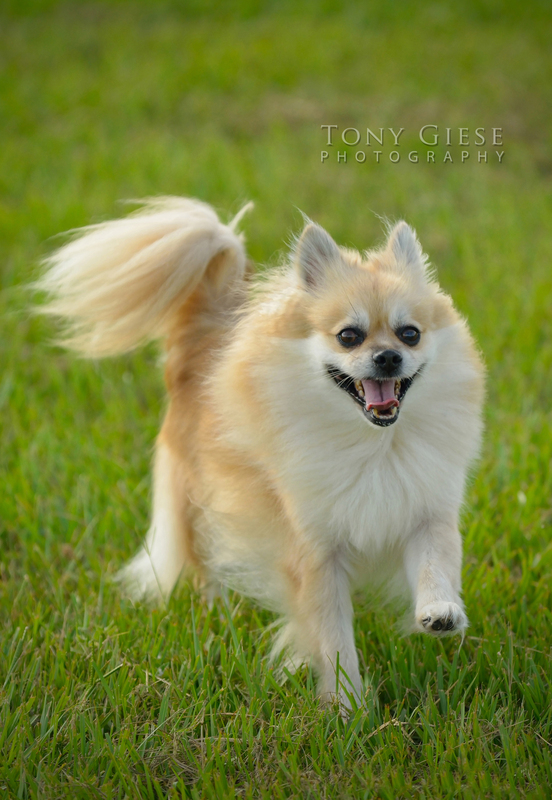 Smiling Pomeranian on the run. 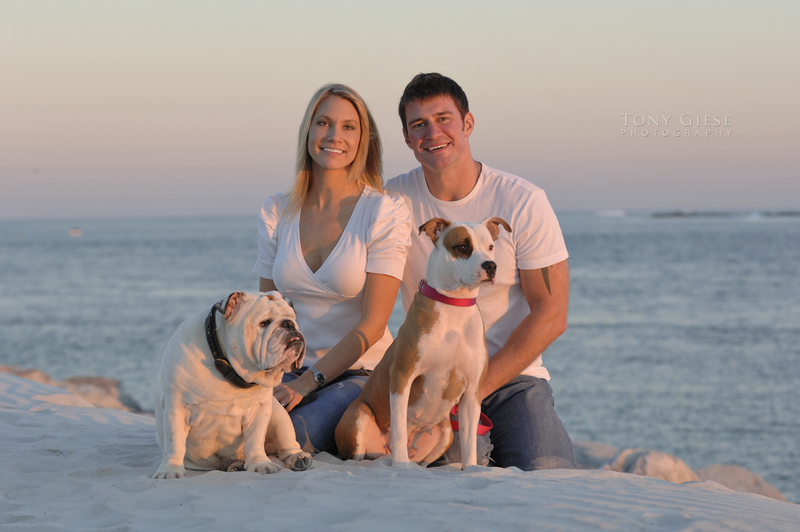 Family portrait session with two dogs at Lighthouse Point Park, Ponce Inlet, Florida. Black dog chasing mullet on the river. 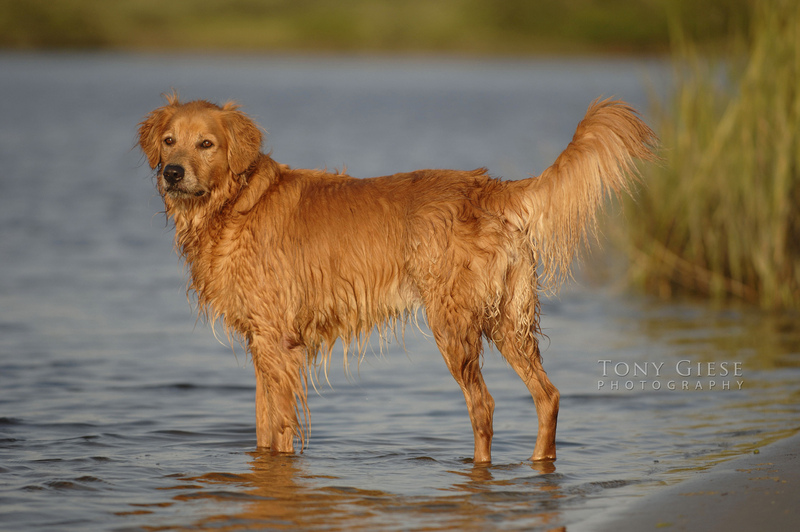 Wet Goldern Retriever enjoying the Intracoastal water. Chocolate Lab jumping off dock into lake. 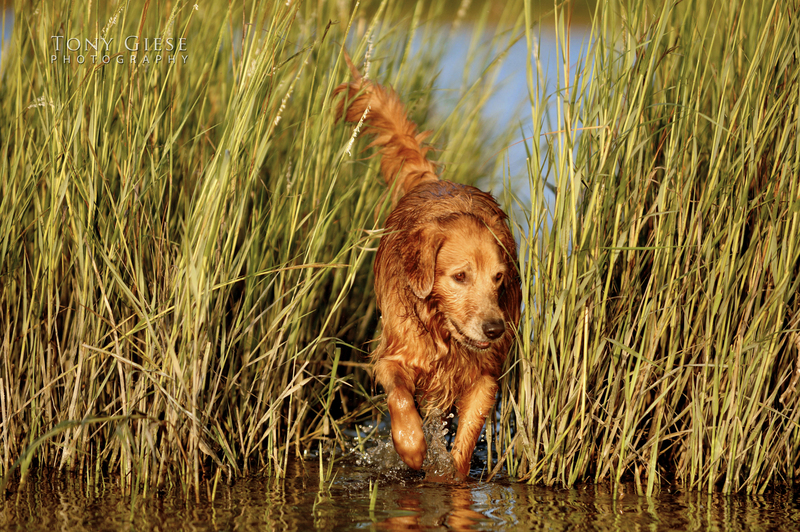 Golden Retriever exploring marsh grass. 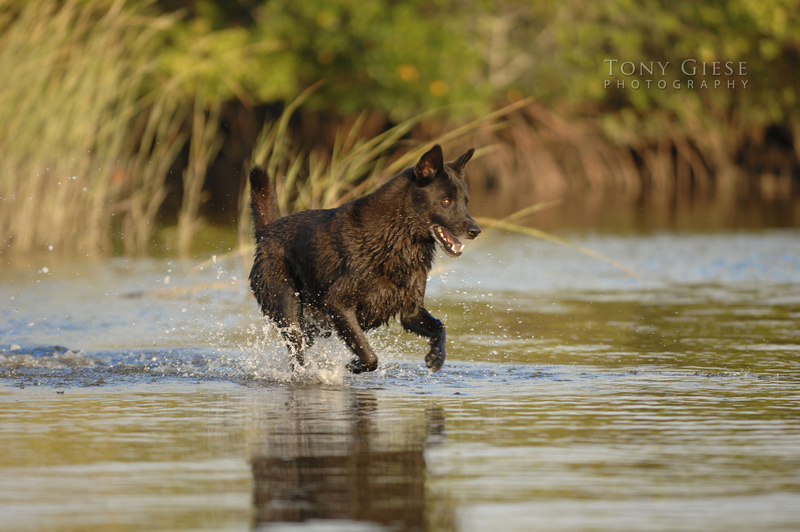 This entry was posted in My Posts and tagged Beach fun, Beach portraits, commercial photographer, creative photography, daytona beach, Dog photography, dog portraits, dog's photograph, Pet photography, portrait photography, Tony Giese Photography. Bookmark the permalink.